P48 Trucks - So this is what the fuss is about! Time to install the turntable and see how it works. I made a new shaft for turntable Mark II. The bands came out a bit nicer than the earlier version as I learned from that experience. I tinned the brass shim stock before wrapping it around the shaft, then a quick touch with the soldering iron secured it in place without melting the plastic shaft. Note that I have not soldered the wire leads to the brass bands at this point. They are dangling from the center of the turntable. Before attaching the shaft, I placed the turntable on the terrain surface at its intended site and carefully marked the center line of the pivot point. Then I drilled out the center with a 1/2 inch bit to create the pivot hole in the base plywood. The foam here is 3/4 inch thick. Next I measured the center of the turntable and installed the shaft, taking care to keep it square and plumb. I epoxied the shaft and a laser cut collar on the bottom of the turntable ties. I could not laser cut everything to exact center due to the design of this turntable, so I had to measure the center by hand. Once the 5 minute epoxy was cured, I soldered the wires to the bands in holes that I drilled in the shaft. The turntable pit after hogging out the foam. Shaft and collar before the wiper wires are installed. I marked the perimeter of the turntable on the foam with a pencil on the end of the turntable as it rotated. Then I hogged out the foam and removed any traces of hot glue that held the foam in place. Luckily there wasn't too much hot glue, but there was a glob right where the shaft went. I tried two different height collars to see which one gave the proper rail height. Then I glued the appropriate collar in place. I temporarily placed the turntable in the collar and kept it spinning while the glue on the collar set. I again used 5 minute epoxy as it sets faster than yellow glue, yet gives time to make adjustments and is very strong when dried. When that epoxy was cured, I again checked the turntable and made some minor adjustments. Then I went underneath and glued a second set of collars on the bottom of the plywood. These two collars are providing the precision placement of the turntable, not the hole drilled in the plywood. Once everything was cured, I tested the turntable again. The spin is nicely centered and smooth. It is easy to line it up by eye, a good thing as this is a manual operated turntable. The shaft and collars not strong enough by themselves to prevent the turntable from rocking as the engines roll on them. These engines are quite heavy, perhaps three or fours pounds, each with the weight concentrated in the tender. In the prototype the turntable wheels control the rocking, but I am not sure the model wheels will be strong enough. I think I will install two rub plates under the ends of the turntable that will lightly rub along the pit rail. These should prevent any excess rocking and thus the wheels will be mostly decorative. The rub plates will be almost invisible, so they will not ruin the look of the model. Unlike the prototype, I have essentially unlimited torque to spin the turntable, so the rub plates friction shouldn't be a problem. I continued work on the rebuilt turntable. I removed the ties as my attempt at making the turntable look "homemade" just made it look like I was a bad builder. I trimmed all the ties to the same length and reinstalled them. Then I added the NBWs along the chord. These bolts are what hold the ties to the chord, as there is no wooden support member under the ties other than the pivot pedestal. I did not add the NBWs on the bottom of the chord as I don't think they will be visible. Before I added the rail, I measured the proper location and drilled two holes for the turntable feeder wires. Them I soldered the feeders to the bottom of the rail. By running the feeders through the ties I ended up with no visible solder joints. Then I spiked the rail down. The overall length of the table will be 12.5 inches, or 50 scale feet. Next I have to build a new shaft and pedestal, as well as all the rest of the details. I'll probably laser cut the roller wheels. In careful study of the picture I note that they are not flanged. Also, look at the pit rail it rides on. It doesn't look like rail to me. I suspect that it is a wood base with a strap iron railing. A mock up of the engine terminal at Falmouth. A wood rick, water tank and engine house are still to be built, as well as the terminal tracks. I received a question about the bearing plates on top of the trusses from the ACWRRHS Yahoo forum. Yes, there are metal bearing plates on the tops of the posts. These prevent the truss rods from cutting into the wood. They also shed water off the end grain, though that may be a secondary concern as the whole turntable doesn't look like the builders were concerned with longevity. There also appear to be iron end plates at the ends of the chords. I plan to use my laser to cut the plates from 1/16 inch acrylic. What thickness iron do you all think those truss rods are? The heaviest wrought iron rods specified in Haupt's bridge book is 1.5 inches. That scales to about 0.032 inches nearly perfectly. But to me they look beefier than that. Finally, I wonder why they mortised the posts into the chords. The mortise joints don't appear to be that tight. The joints would significantly weaken the chords in bending, but not so much in compression, since the upright post would see a compressive load acoss its width. The design of the truss does put the chord into compression, but it would experience bending moments as the live load moves along the turntable. The chords are relatively massive, especially for such a small structure. They help give the turntable a "chunky" look. But I think the iron rods are providing most of the strength of this bridge. I was not happy with the look of the first turntable. 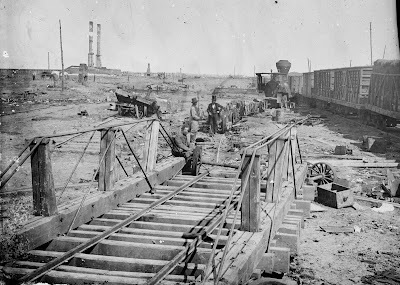 The actual Manassas turntable was quite rough in construction. Mine was looking too "square and regular." Excerpt from Railroad and Engineering Journal, Vol LXIII, No 10. Further research into early turntable designs revealed that gallows style turntables did not have rail stringers. In looking at the Manassas turntable, I concluded that it was very similar to a gallows style where the ties form a suspended deck. However, the Manassas turntable uses a wrought iron rod tension truss instead of a gallows. I was concerned about racking and twisting forces on such a design without a rail stringer, but a passage from an engineering book on early turntables explained that due to the low speed involved, those forces are minimal. So I am rebuilding the Falmouth turntable be be a closer match to the Manassas prototype. I did not use the laser to cut these parts as I intentionally wanted some subtle variation in dimensions that comes with hand cut parts. I sanded the sharp corners and distrressed the wood slightly to make the parts look more "homemade." These parts form the main chords. I find it hard to believe that they mortised the main chords to accept the vertical truss supports, but the photographic evidence clearly shows this. I am going easier on the black stain this time around as the wood should not be overly weathered. I'll have to make a new shaft and pedestal to make sure the height is correct. Each tie has 4 visible bolts that hold it against the main chord. The bolts are in a distinctive pattern (see the prototype photo on the previous post). Adding these will be tomorrow's project. You really have to like adding NBWs to be an O Scale modeler in this period. I nearly finished all the wiring in the main room this weekend, but I need 3 Frog Juicers to wrap it up. I ordered two more Hex Frog Juicers (enough for 12 turnouts) so I can finish the wiring here and be ready for the yard at Aquia Landing. Even with incomplete wiring, I ran the Engine Haupt with a short train to test track. Now that the double crossover in Falmouth is operating with auto reverse units on the frogs, I discovered that some fine tuning of the turnouts was needed. under the ties and rails. I assumed there were. So with wiring on hold, I started construction of the Falmouth turntable. The turntable is needed at Falmouth to turn locomotives so they can make the return trip nose first. The turntable is loosely based on the prototype at Manassass seen in the famous photo after Jackson's Raid in 1862. Edwin Alexander made a set of plans based on the photo, but something about his plan didn't look right to me, so I modified the design to reflect how I think it may have been. I used laser cut 3/16th inch basswood for the main structure and sugar pine ties from Mt Albert. I added many Tichy NBWs to simulate the bolts holding the beans together. However, I did not simulate the laminations of the beams. I still need to add the truss rods, wheels and other details. The pedestal separated from the shaft. The pedestal will be glued to the pit floor. The shaft is a set of 1/2 inch and 7/16 inch Evergreen styrene tubes that telescope tightly together. I epoxied the tube to the center hole in the turntable bridge. To make the conducting bands, I soldered 26 gauge wire leads to strips of 0.005 inch shim brass. Then I drilled holes in the shaft, ran the leads into the holes. Next I wrapped the brass bands tightly around the 7/16ht inch shaft and quickly soldered them without melting the plastic. With this design, the turntable shaft can slide into the pedestal. The pedestal will be glued to the pit floor. If all goes to plan, I'll be able to drop the turntable through the hole. Then add electrical wipers to the bands. I'll use a digital autoreverse unit to control the power to the rails. This is a manual turntable, so I will not be using an indexing system. It's "armstrong" all the way. It just occurred to me that this is the first turntable I have ever built either from scratch or kit. I had a Walthers N Scale turntable, but never installed it. and hog out the styrofoam. Thanks to some expert help from Paul Dolkos and Mitch Oldham, the USMRR Aquia line is now running on DCC. I was able to get most of the wiring done from Falmouth to Aquia Landing, but that is getting ahead of the story. Paul is an owner of the Easy DCC system for his HO layout, so he was able to immediately open the boxes and begin connecting the components without any delay. Well, there was one delay. It seems I had forgotten to disconnect the DC power pack from the rails. When Paul went to fire up the DCC system, the start-up sequence was not what he normally sees on his system. After a few perplexing moments wondering why the Easy DCC was not going through its normal start up procedure, I smelled smoke. Sure enough, the DC power pack was beginning to put out a serious amount of smoke. I disconnected the smoking power pack, and the Easy DCC system fired right up. Whew! I am glad the Easy DCC didn't fry. In the meantime, Mitch was installing a decoder in the 4-4-0 Haupt, one of my SMR Masons in the work shop. Mitch used to run a DCC business and he came prepared with all manner of cool specialized DCC diagnostic tools. He methodically disassembled the Haupt and identified pickups, grounds etc. Then he went ahead and installed a Digitrax DH123D that I had previously purchased. This is a non-sound, economy decoder. I also had a Dallee Sound System sound chip, but we decided not to install it as it is pretty large and probably would not fit in the tender or boiler. With the decoder installed the engine ran very well. However, I don't think this decoder features back-EMF as the engine speed varies as the loco moves across the tighter curves on the layout. The loco's headlight light is always on when DCC power is on the track and is running quite bright. That must be addressed before it burns out by adding a resistor in line with the bulb. This will require running wires from the decoder to the headlight, but it looks easy thanks to the removable smoke box, a nice feature of the SMR Masons. We learned a lot from Mitch's surgery on the Haupt. The removable smoke box and head light assembly will simplify many of the tasks needed to add sound and controllable headlight. We decided that on this loco the best place for the sound speaker will be in the smoke stack. Again this will require wires from the tender to the engine, but it shouldn't be too hard. We also learned that the tender trucks have a split frame, so adding a second set of pickups on the tender axles will be relatively simple. (Note the McCallum already has these wires factory installed.) I will replace the DH123D with a Soundtraxx Tsumani decoder so that sound is integrated right in the DCC decoder. In fact I need to order five of them ASAP. Mitch took the McCallum home with him to try to find why it is shorting on curves. He plans to get one too, so this will be win-win as he gets to study the loco before he buys it. He is making the switch from HO to O Scale ACW - Huzzah! Christmas tree. The yellow wires run to the various frogs. power districts. For now they are daisy chained into one district. After Paul and Mitch headed home, I finished running bus lines, soldering feeders and installing the Hex Frog Juicer. Tam Valley Depot makes the Hex Frog Juicer and it is an absolute delight to install. No more fiddling with balky Tortoises or finicky mechanical linkages underneath the benchwork. This has to be the easiest way to power frogs. I have four frogs wired to it so far and it works as advertised. Thanks Duncan! Terminal strip to allow smaller wires to be used on the HFJ sockets. ﻿ Another half day of wiring and two thirds of the layout will be operational. Running with wireless throttles is really a pleasure that I had nearly forgotten. I decided to rewire the HFJ to use smaller wires than the 18 gauge into the sockets. I added a terminal strip. This acts as an intermediate between the 18 gauge wires and 24 gauge wires. The holes on the HFJ sockets are very small. Thelast two FJs power the double crossover in Falmouth. I happened to find recently Andy Eccleshall's website devoted to backdrop painting. https://themuralworks.wordpress.com/tag/model-train-scenery/ Andy is a professional artist that will custom paint a backdrop for your layout. His work is quite good. Check out the video on his site that depicts a large O scale layout he did. Very cool. I may try some of these other clouds as I finish my backdrop. I've have just about finished wiring the track from Aquia Landing to Falmouth. The Stoneman's block is the only one not done. There is just one more turnout to finish gapping and a switch stand to install. Then run the bus wire for that block and solder on the already dropped feeders. An astute observer might say, "Wait a minute, you showed us a video in April of trains running at Stoneman's?" Yes, but that was temporary wiring with alligator clips and spiked down turnouts. This is the real deal. Of course, I still need to lay track in Aquia Landing. But, once this section is wired up, and I get a few more cars built,I could try a simple op session. Here is a short video showing a test run from Aquia Landing to Stoneman's Station. Note that the train speed is probably a bit fast. The USMRR instituted a 5 MPH speed limit on the whole railroad. So when operating, the trains should move much slower. Just as I started the train moving and hit the iPhone video record button, the Whiton came to an abrupt halt. It wouldn't move forward or back. I tried to manually move it and it wouldn't budge. The loco was stuck. I was able to quickly discover that a tiny screw from one of the crank arms came loose and the crank arm dropped down and jammed against a tie. Of course this happened just as the train was leaving Aquia Landing in the hidden section. If the mountain was finished, it would have been much tougher to diagnose the problem. Luckily I was able to extract the train by gently rocking it side to side. Then I spotted the tiny missing screw, not much bigger than a sesame seed, precariously perched on the edge of the roadbed. It put it back on and the engine ran fine. Note to self, make sure you tighten those screws every now and then. Maybe even get some extras. How about some Loctite? I finished wiring the sidings at Brook tonight. I ran some test trains through the siding and things looked good. I can now run trains from the Aquia Landing entrance to Potomac Siding. I had to wire temporary feeders to the frogs. The locos benefit from the powered frogs. 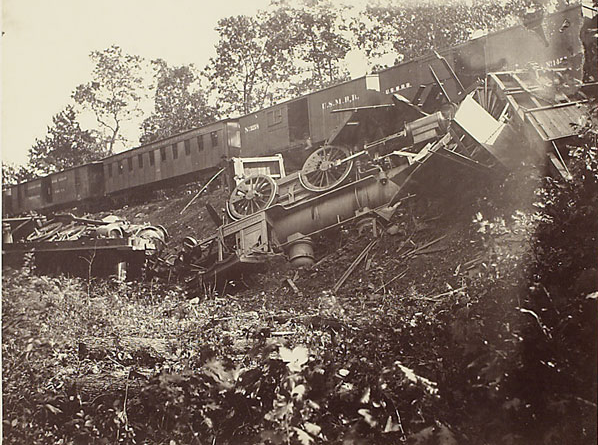 With dead frogs the locos tend to stall. As I stated in an earlier post, once I get DCC installed in the locos I'll be able to connect the Frog Juicers to power the frogs. My problem is not this obvious! I fixed the front pick up on the pilot truck of the McCallum by bending the wiper so that it rubs in a non-interfering spot. But as I tested it more problems have surfaced. It runs fine on straight track. The problem now is on curves. It appears that the engine part of the loco is experiencing a high resistance short when it enters a curve. Just about any curve will cause the problem. The McCallum tender has a new design that picks up from both sides. The tender by itself will run just like a "diesel" (note the earlier Mason locos don't have this extra pick up on the tender. They must have the engine attached to pick up on both sides. I can fix this as I add DCC by adding additional wipers to tender axles on those locomotives.) Without the engine attached, the McCallum tender runs fine. But hook up the engine and it stalls on curves and shorts the track. I tested every other engine and all four run fine, so it is something wrong in the McCallum's engine. I looked over the engine, but could not find the issue. I'll have to work on this later. For now my objective is to get the wiring done to Falmouth so that we can run the completed sections of track. 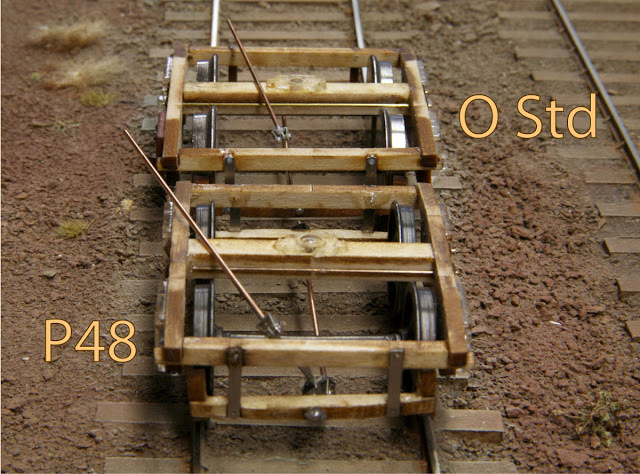 Paul Dobbs, one of the ACWRRHS members, is building an O Scale ACW layout in P48. For motive power he plans to kit-bash an old Rivarossi plastic model 4-4-0 into a P48 operating locomotive. Where did this kit come from? Rivarossi was an Italian company founded in 1945. Lionel briefly distributed their models in the United States until Athearn and then Associated Hobby Manufactures (AHM) took over. AHM closed operations in 1985. It is common to find older packaging marked AHM Rivarossi. During their heyday, AHM Rivarossi released at least five American prototype O scale kits including: 0-8-0 Indiana Harbor Belt heavy switcher, 4-6-0 Illinois Central "Casey Jones", V&T 4-4-0's #12, "Genoa", and "Reno"
In the 1990s Rivarossi acquired Lima (1992), Jouef and Arnold (1997). In 2003 Rivarossi went into receivership, the last of many times. In 2002 the US importer folded leaving debts greater than the capital value of Rivarossi. In 2004 Hornby Railways PLC acquired assets from Rivarossi, in particular the brands Arnold, Jouef, Rivarossi and Lima. Since 2006 products are sold again under these brand names. To my knowledge the O Scale locomotive kits have not been rereleased. The plastic kits can sometimes be found on Ebay. I am not sure what powering kit Paul plans to use, but he mentioned that he needed P48 trucks for his freight cars. 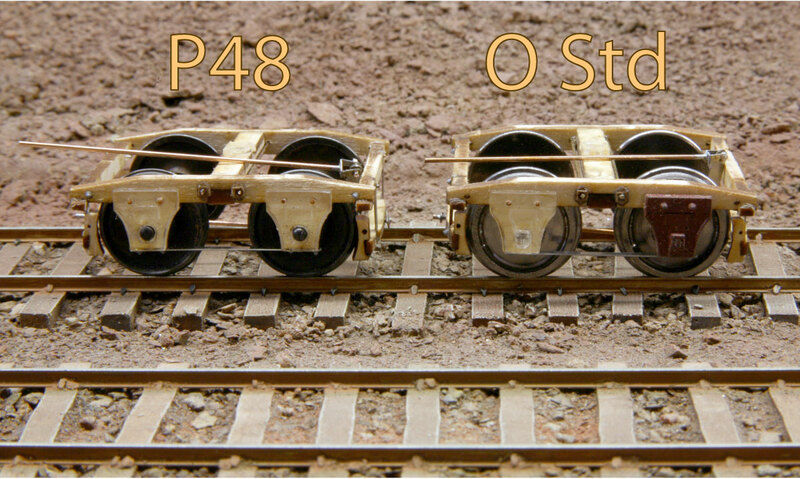 I modified the design of my O Scale my trucks to accept a p48 wheel set that Paul provided. The photos the P48 trucks compared to my standard gauge O Scale trucks. The wheel sets in this test have a significant extension of the axle to the outside of the wheel face. As a result, I was unable to make journal covers for the P48 trucks since the axle shafts extended past the journal boxes. Otherwise, the truck uses the same design as my standard gauge trucks, including the working brake mechanism. 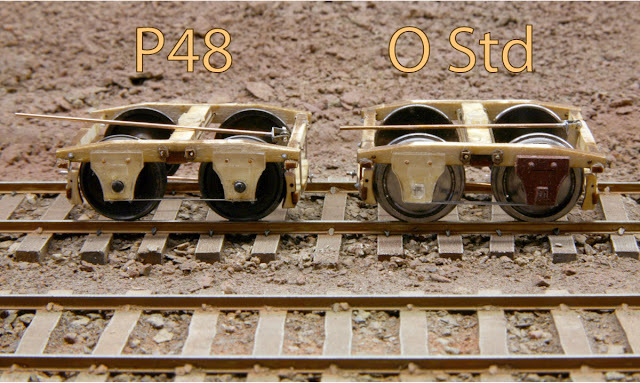 The P48 wheels will just barely rest on the standard O gauge track, but they will not operate on it. They require track built to those specs. So you be the judge, is the difference worth converting all those SMR locomotives to P48? I know what my answer is. In looking at these photos it occurs to me that I may be able to make the O Std truck narrower by using the same idea I used in the P48 truck. That is, make the axle hole in both the frame and the journal. That would allow the frame sides to lie closer to the wheel faces. The main problem with these wheel sets in the amount of axle that protrudes from the wheel face. The O Std wheel sets have a pointed axle to reduce friction. But if you don't rely on that point to hold the axles, and use the flat part of the axle as a bearing surface, you could make the overall truck narrower. Stephen Borona, DC Cebula visiting the layout. This weekend saw the ACWRRHS Annual meeting in Alexandria, VA. The meeting kicked off with an introduction by Jon Vrana and Reene Linder. Then I and Ron Beavers presented talks. My talk was a variation of my Introduction to Railroads of the Civil War presentation while Ron discussed the sites they group would visit on Saturday. ﻿ On Saturday Ron lead the group around sites in Alexandria including the Lyceum, where my car float model is on display, and Fort Ward, one of my favorite spots in Alexandria. Mitch Oldham could not hook up with the group, but stopped by the layout for an early tour. Mitch is a "local" from Warrenton, VA and is planning an O Scale layout in his 1400 sq ft basement. He used to have a model RR business selling DCC components, He expressed an interest in attending future work session. We can always use a wiring guru. After Ft Ward, the group visited my layout. Marty McGuirk came by early to help out and answer questions. Over 22 people visited the layout. While at the house, we had a pizza and salad dinner capped off with Alicia's double chocolate brownies. Later that night Dave Schneider of SMR Trains presented a fascinating talk about some research he did on General Lee's armored rail gun. He also gave a copy of a Ron Hatch poster print depicting a scene from the Great Locomotive Chase to all attendees. DC gave a talk about his collection of railroad research. On Sunday the group will headed out on the O&A RR (now Norfolk Southern) to see historic sites along that famous line. It has been a great time. Thanks to everyone for coming.